Cuckoo Cottage01263 715779work01603 870304fax Self-cateringCuckoo Cottage is located in the village of Blakeney. It was once two fishermans' cottages which have been converted in to the one property whilst still keeping some characterful features. The upstairs is perfect for a family holiday with interlinked bedrooms and bathroom and between the dining and living room is a double sided wood burner for cosy times after a brisk walk along the coast. Blakeney is the perfect spot for a great coastal holiday with its harbour, marshes, stunning scenery and there are plenty of pubs, restaurants and interesting boutique shops to explore all within walking distance of the cottage. • Good Housekeeping Deposit: Please note that a refundable deposit of £150 is required for this property. All bedding is Egyptian Cotton. Cuckoo Cottage is located in the village of Blakeney. It was once two fishermans' cottages which have been converted in to the one property whilst still keeping some characterful features. 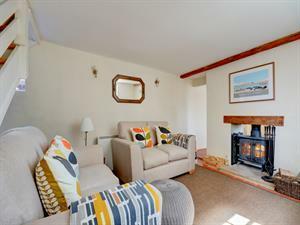 The upstairs is perfect for a family holiday with interlinked bedrooms and bathroom and between the dining and living room is a double sided wood burner for cosy times after a brisk walk along the coast. Blakeney is the perfect spot for a great coastal holiday with its harbour, marshes, stunning scenery and there are plenty of pubs, restaurants and interesting boutique shops to explore all within walking distance of the cottage.